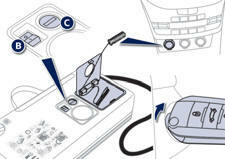 - check or adjust the pressure of your tyres, - inflate other accessories (balls, bicycle tyres...). Turn the selector A to the "Air" position. Uncoil the black pipe H fully. Connect the black pipe to the valve of the wheel or accessory. If necessary, fit one of the adaptors supplied with the kit first. Connect the compressor's electrical connector to the vehicle's 12 V socket. Start the vehicle and let the engine run. 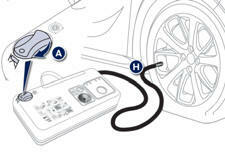 Adjust the pressure using the compressor (to inflate: switch B in position "I" ; to deflate: switch B in position "O" and press button C), according to the vehicle's tyre pressure label or the accessory's pressure label. Remove the kit then stow it.